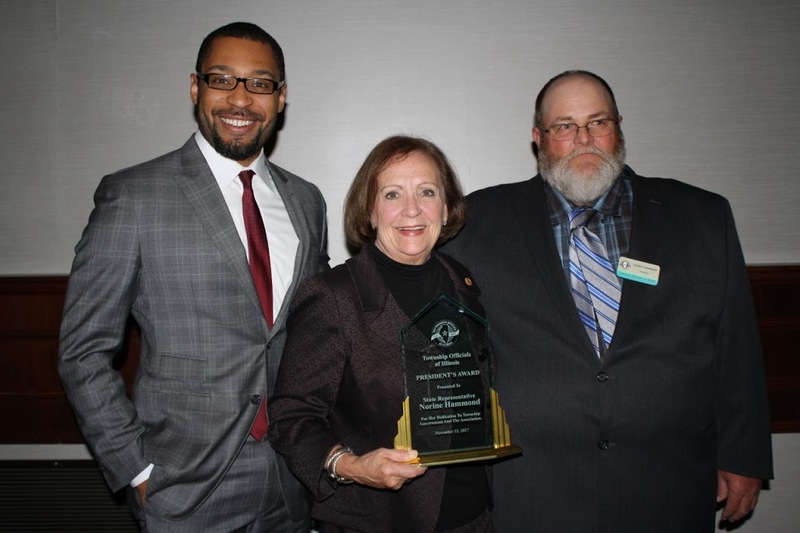 MACOMB –Assistant House Minority Leader Norine Hammond (R-Macomb) was feted by the Township Officials of Illinois (TOI) with their President’s Award at the organization’s annual conference on November 13. “Representative Hammond is a true champion of local government. As a former Township official herself, she truly understands and appreciates the importance of Township government. I could think of no one more deserving of the TOI Presidents Award,” said TOI Executive Director Bryan Smith. Hammond served as Emmet Township Trustee from 2002-2006 and as Emmet Township Supervisor from 2006-2014. The TOI Presidents Award is given each year by the President of TOI to a person who has shown outstanding support to township government and the association. The Award has been given annually since 1982. In addition to her award from TOI, Rep. Hammond has been honored for her legislative accomplishments by the Illinois Health Care Association, the Association of Illinois Soil & Water Conservation Districts, the Illinois Farm Bureau and others. She has also been selected to serve the Illinois House on a number of legislative task forces and working groups and is a trusted member of the House Republican Leadership team.